Ramallah/ Treatment and Rehabilitation Center for Victims of Torture (“TRC”) launched its annual summer camp (We are staying in our homeland) in 13th August 2017, around 80 children whom are victims of the Israeli violations against the Bedouin gathering in Jabal Al-Baba (Mount Pope) in East Jerusalem; participated in the summer camp. The camp was organized in cooperation with the Committee for the Protection of Jabal Al-Baba (Mount Pope). TRC’s annual summer camp was held in Jabal Al-Baba (Mount Pope) due to the difficult and danger circumstances caused by the Israeli occupation in that region, these children face several Israeli violations almost on a daily basis such as the violation of these children’s right to live peacefully in an adequate standard of living as provided under article 25 of the Universal Declaration of Human Rights. TRC’s staff members including psychologists and social workers provided several services and organized several activities for these child victims including protection, treatment and entertainment activities in order to help the children to express their feelings and allow them to discharge all the negative mentality caused by the difficult and danger circumstances. Besides working on providing a better life for these children, TRC is working on the rehabilitation of their mental health, especially those who went through shocking and distressing experiences including children whom houses were demolished, or whom houses are being broken into at night by the Israeli occupation forces, therefore, TRC is working to convert their negative mentality into a positive and hopeful mentality in order to prepare these children to start the new academic year with passion and motivation. In this context, and due to the continuous Israeli violations, TRC is working on series of activities for these children and will do its best to provide these children with a better life in all fields (entertainment, health, education, … ). 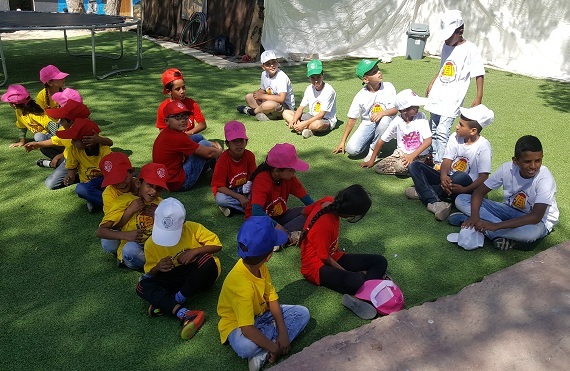 This summer camp was sponsored by the Palestinian Prime Ministry, the National commission for Summer Camps, Jawwal Inc., Sinokrot Global Group, National Beverage Company Coca-Cola.